Special Education Past, Present, and Future: Perspectives from the Field (Advances in Learning and Behavioral Disabilities) est le grand livre que vous voulez. Ce beau livre est créé par Timothy J. Landrum. En fait, le livre a 250 pages. 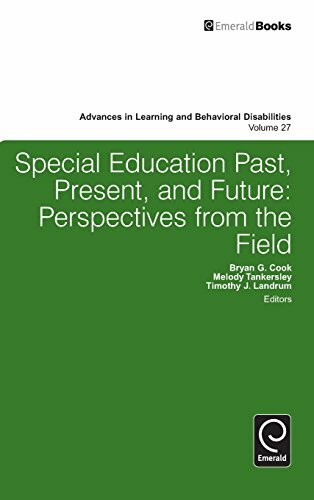 The Special Education Past, Present, and Future: Perspectives from the Field (Advances in Learning and Behavioral Disabilities) est libéré par la fabrication de Emerald Group Publishing Limited. Vous pouvez consulter en ligne avec Special Education Past, Present, and Future: Perspectives from the Field (Advances in Learning and Behavioral Disabilities) étape facile. Toutefois, si vous désirez garder pour ordinateur portable, vous pouvez Special Education Past, Present, and Future: Perspectives from the Field (Advances in Learning and Behavioral Disabilities) sauver maintenant. This volume explores serious challenging behavior in schools, with an emphasis on promising and research-based approaches to dealing with such behavior. Topics include what we know about (a) the nature and extent of the problem (e.g., rates of aggression, violence, and noncompliance in schools); (b) addressing extreme forms of noncompliance; (c) dealing with serious disruptive behavior; (d) violence prevention programs; (e) schoolwide response to aggression and violence; (f) issues of covert antisocial behavior (e.g., vandalism, truancy, theft); (g) functional behavioral assessment and function-based interventions; (h) legal and policy considerations in disciplining students with disabilities; and (i) promising and needed avenues for further research.